30 years experience, recreational and commercial diving. Course Director, National Association of Underwater Instructors. Graduate, Florida Institute of Technology, School of Underwater Technology. Emergency Medical Technician Certification, Florida Institute of Technology. Diver Medical Technician, National Association of Diver Medical Technicians. Commercial Deep Sea diver, deepest dive 550-feet. Instructor to military personnel and commercial oilfield divers in mixed gas and saturation diving techniques. United States Merchant Marine Officer, Master Captain. 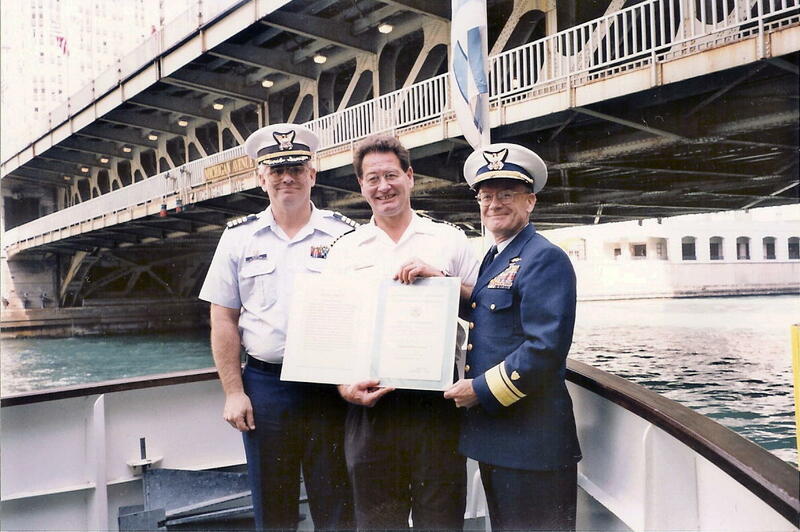 Awarded the Public Service Commendation by the United States Coast Guard. Merit badge counselor for scuba diving Boy Scouts of America. Publisher, Midwest Scuba Diving Magazine. If you can find another instructor in the Chicagoland area with more diving experience or better credentials, we will pay you to take that instructor’s course! SAFETY IS OUR PRIMARY FOCUS. Captain Darrick Lorenzen receives the USCG Public Service Commendation for Personal Courage and Selfless Initiative from the Rear Admiral James D. Hull, Commander, Ninth Coast Guard District.